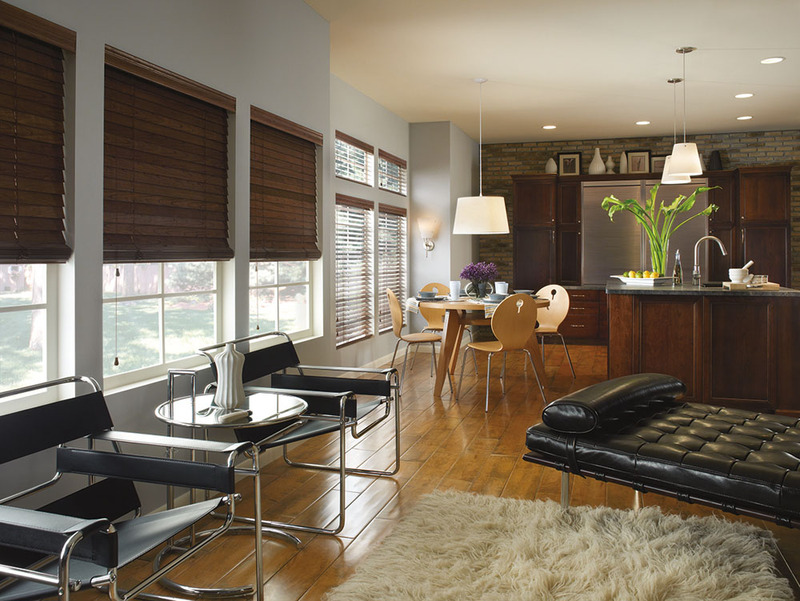 Arjay’s Window Fashions provides a full range of Wood Blinds for both Commercial & Residential use. We have expert designers and use leading technologies to provide solutions that not only look good, but perform amazing as well. Sturdy blinds require very little maintenance. If you clean them regularly, they maintain their beautiful finish. 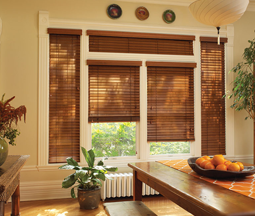 Simply wipe off the blinds each week with a clean, soft dust cloth or gently vacuum the slots with the brush attachment. 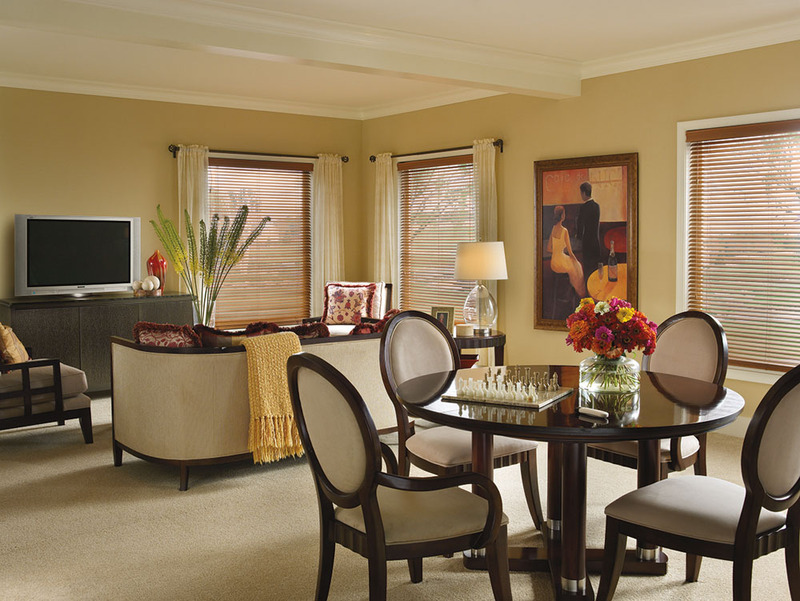 This maintenance ensures your blinds retain their attractive color and last a long time. 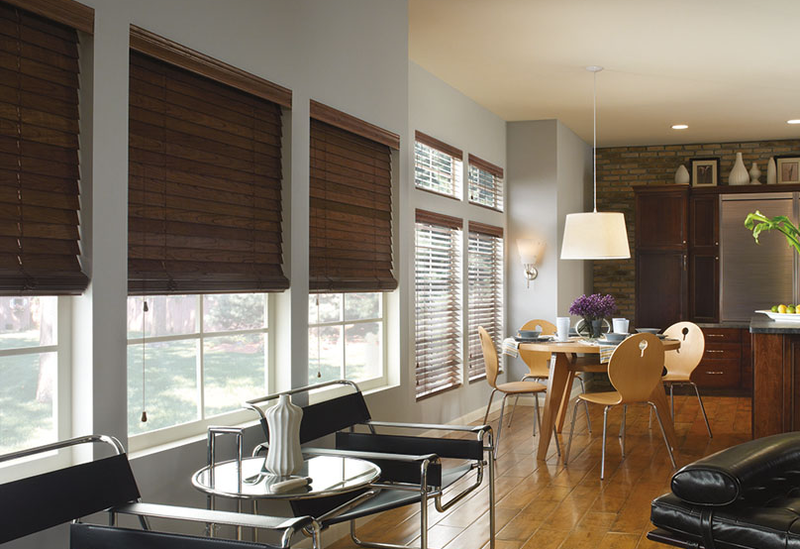 A variety of stain selections and finishes ensure you can hang wood blinds in almost every room of your home. 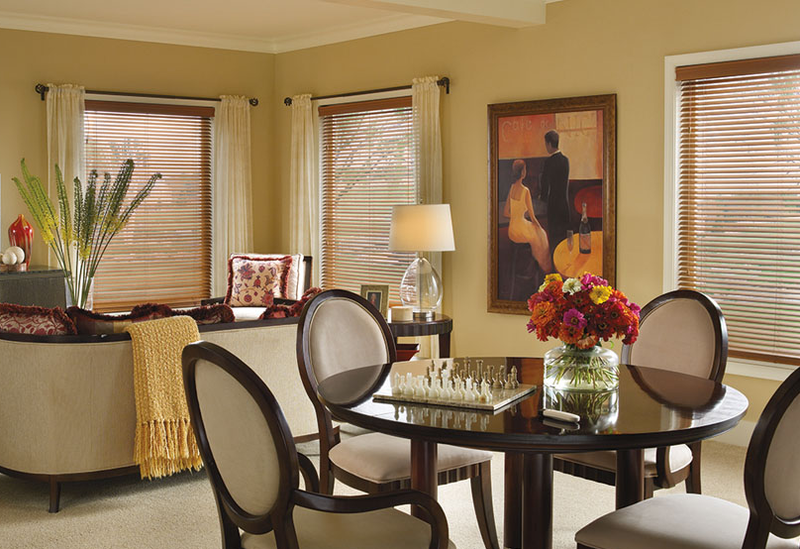 As an alternative to stain, choose painted custom wooden blinds that match your wall colors or complement existing decor. This custom feature gives you numerous decorating options as you turn your house into a home. Wood Horizontal Blinds are manufactured with 1”, 2”, 2 1/2” and 3” louvers and are available in a variety of different wood species. The louvers can be tilted at different angles to control light and louvers can be manufactured without route-holes for enhanced privacy. The painted and stained louvers have a variety of matching designer valances as well as larger decorative cornice boxes. In addition to the standard paint and stained finishes, distressed and faux-finished wood is also available. 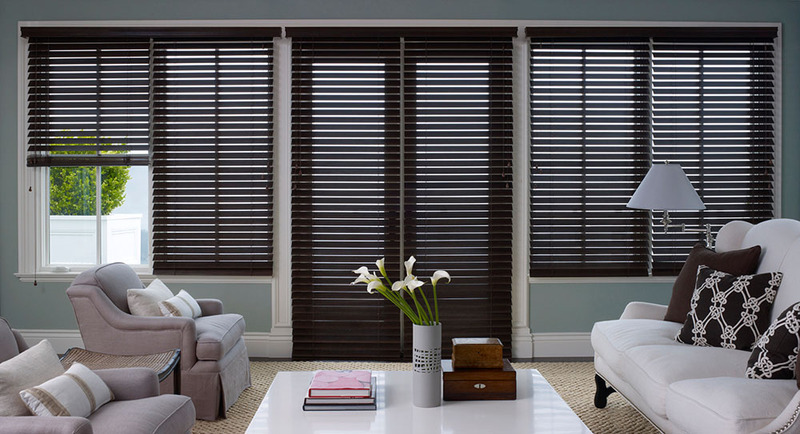 Control Options: Wood Horizontal Blinds can be operated by Cord Tilt, Wand Tilt and Routless (no route holes) Operation for greater privacy and light control. Blinds are also available without lift cords where the bottom rail is buoyant and the blind is raised and lowered by pulling or lifting the bottom rail. Specialty Shapes: Wood Horizontal Blinds can be manufactured Arched and with Angle Tops. 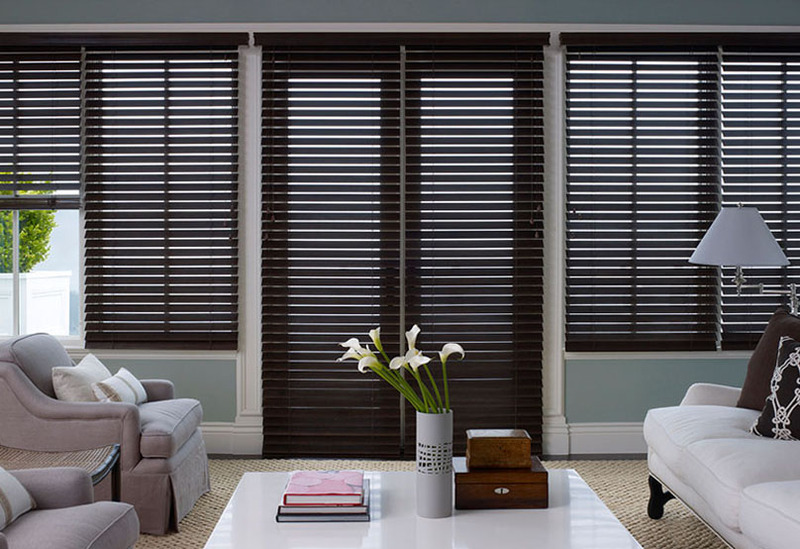 Designer Features: Available in Bass Wood, Cherry, Mahogany, Oak, Knotty Pine, Alder and other wood species; wood blinds can also be distressed and faux-finished. Designer Fashion Tapes that coordinate with other furnishings can replace standard drop cords. The headrails can also be concealed beneath a variety of stylish valances and cornice boxes. Motorized Operation: Wood Horizontal Blinds can be motorized and operated via remote control or integrated into building automation systems. Energy Consumption & Comfort: Light colored wood blinds can be used to reflect solar heat and control hot spots in a building. Light Control:: Horizontal louvered products do an excellent job in controlling high profile sun because the louvers cross-shade each other. The louvers can also be completely closed for room darkening.